Most business owners know that in the era of social media, smartphones and unlimited connectivity that SEO is a must to grow online. But since it’s constantly growing and changing, there’s a ton of bad information out there on SEO. I’m not exactly sure how any of these SEO myths started. It may have been bad information or just confusion that got out of hand. In either case, we want to spread the word that these SEO myths need to go away and never come back. Okay, I get why this myth exists. SEO is constantly changing but it still seems like half the SEO “experts” out there are depending on outdated information from 2006. And don’t even get me started on those people who promise incredible SEO results for a ridiculously low one-time price. Unfortunately, those people have made a bad name for SEO and have left a yucky taste in the mouths of business owners across the world. Online marketing is only going to become more important and SEO is going to play a big part in its growth. So just casting it aside as a fad or just another way for your marketing person to squeeze a little bit more cash out of you is a bad idea. The important thing to remember is to do your homework. 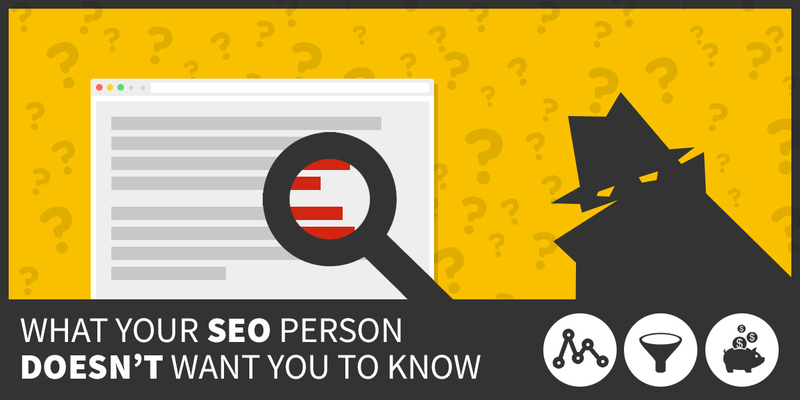 Know what’s going on in the world of SEO so you don’t get taken advantage of. Google search engine bots will crawl your website and jump from page to page indexing content. But if you don’t have the right page structure and don’t do your part for SEO, the bots won’t be very helpful. The great thing about SEO is that you can do a whole lot for your website just by knowing (and actually doing) the basics. Things like sticking to one well researched keyword per page, adding it to the page title, url and headline won’t be strenuous, but these simple SEO techniques can make or break your rankings. I’m going to be honest here. Small businesses can’t compete with big businesses when it comes to SEO. They have way bigger budgets and the teams needed to constantly be monitoring and updating pages. The ability to make quick changes. The ability to make personal connections with customers. The ability to have laser target focus when it comes to keywords. Big companies are like giant cruise ships. They have a lot of power behind them, but when they need to change their route, it can take a long time just to get them to move in the right direction. Small businesses are like little speed boats. They may not have a lot of people or space onboard, but by not having a lot of weight or extras they can move effortlessly at a moment’s notice. So if you’re seeing your keywords aren’t really working, you can do the research to find better ones. You can see what your competition is using and you can add new, better keywords to your website without going through 5 tiers of management approval. If you’re trying to compete with a national chain for a generic keyword, you’re probably not going to rank number one. So embrace your small business power and get hyper niche. Try doing this by narrowing down your keywords by location, specialty and descriptors potential visitors are using. You’ll end up with longer keyword phrases, but since they’re so niche, you’re more likely to rank higher in a niche search. The simplified version – social media has a huge impact on SEO. Constantly staying on top of social media can be overwhelming sometimes. One expert might say posts at these times, which is the opposite of what another expert says. If you don’t have a ton of followers on social media, it can be kind of tempting to just stop doing it all together, but don’t do it! Social media is more than getting followers to engage with your brand. It’s also a great (not to mention free) tool to market your business online. In the good old days search engines used to be a lot more trusting of websites. Business owners could add in their keywords and the search engines would index accordingly. But as always, some shady people ruined it for everyone. These people would add in irrelevant keywords, use misspelled words to try and get accidental traffic and much more. So search engines had to figure out ways to rank content that couldn’t be cheated. Enter: social media. Social media shares, likes and comments are hard to fake on website pages. Tying into this is the importance of blogging and content creation. When you’re constantly producing new website pages that your visitors find engaging, informative and entertaining you’re creating new opportunities for them to share. So even if you’re not ready to fully to commit to content, by just creating 1-2 blog posts per month you’ll start to see a bump in website traffic over time. We hate these SEO myths. It’s our hope that more business owners start to see through the bull and these myths die out in the next year, but I’m not keeping my fingers crossed. SEO myths, as well as other marketing myths, will pop up from time to time. Which is why it is so important to do your homework before making any big commitments. Your business and your wallet will thank you.